As its name suggests, the guitar Prudencio Saez STAGE is the perfect tool for the performing musician. A nylon guitar that is ready for the stage. 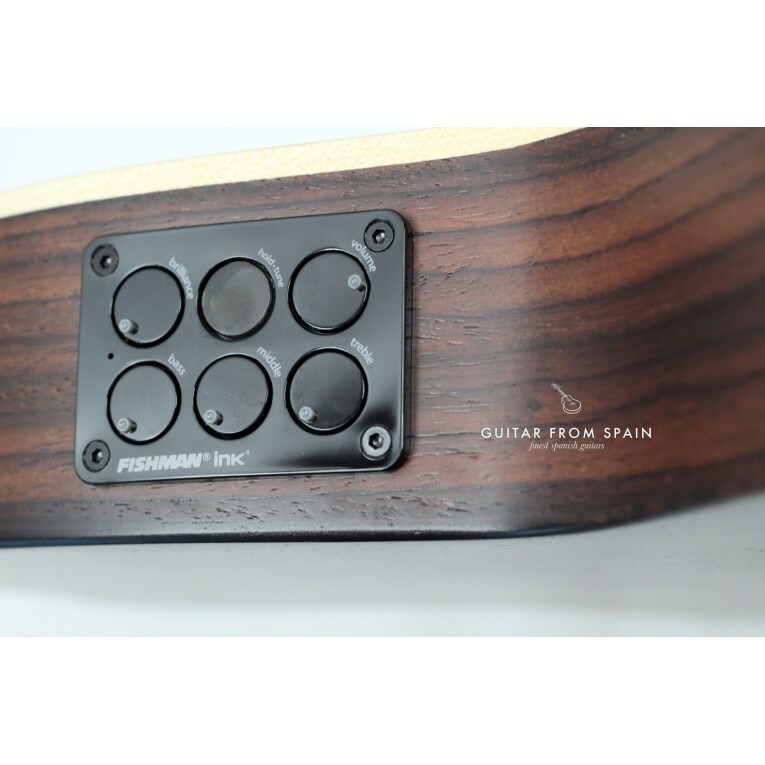 Less feedback, less weight, a more comfortable neck and all the sound you need from a electro classical guitar Made in Spain. The Prudencio Saez STAGE hasn't got a sound hole on the top like most classical guitars. In stead, it has a "sound port" on the upper side of the guitar. 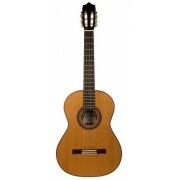 The neck is thinner and narrower than a typical neck of classical guitar, so it can be considered a Crossover guitar. It features a thin body with cutaway and the finishing is made with a thin layer of matt varnish, leaving the pores of the wood open for full resonance. Available with spruce, the Prudencio Saez Stage has a rosewood body, ebony fingerboard and a truss rod inside the neck. It comes equipped with Fishman INK IV electronics. Of course, it also sounds unplugged. As its name suggests, the guitar Prudencio Saez STAGE is the perfect tool for the performing musician. A nylon guitar that is ready for the stage. Less feedback, less weight, a more comfortable neck and all the sound you need from a electro classical guitar Made in Spain. The Prudencio Saez STAGE hasn't got a sound hole on the top like most classical guitars. In stead, it has a "sound port" on the upper side of the guitar. The neck is thinner and narrower than a typical neck of classical guitar, so it can be considered a Crossover guitar. It features a thin body with cutaway and the finishing is made with a thin layer of matt varnish, leaving the pores of the wood open for full resonance. Available with spruce top, the Prudencio Saez Stage has a rosewood body, ebony fingerboard and a truss rod inside the neck. It comes equipped with Fishman INK IV electronics. Of course, it also sounds unplugged.
" on the upper side of the guitar. 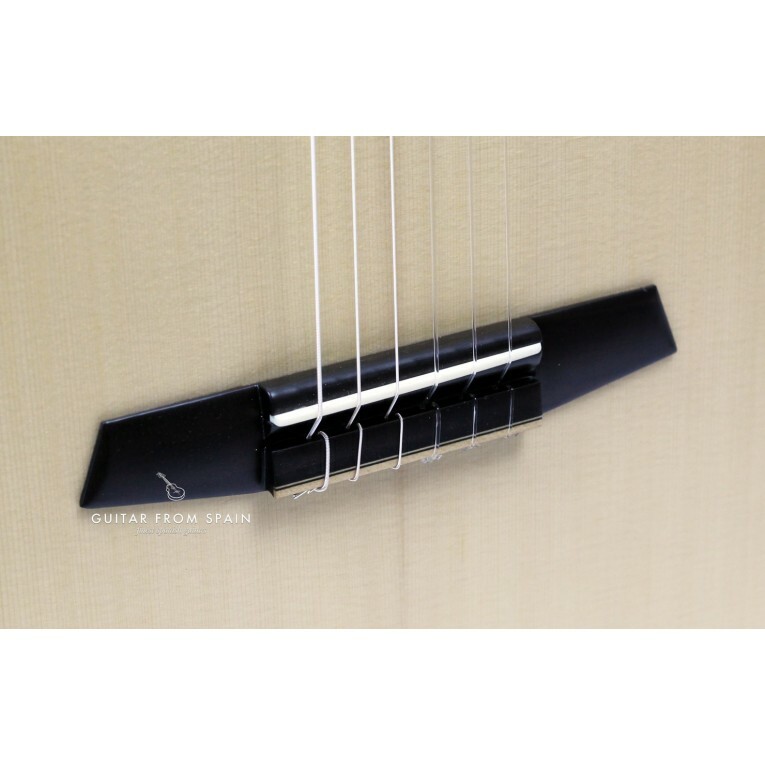 The neck is thinner and narrower than a typical neck of classical guitar, so it can be considered a Crossover guitar. It features a thin body with cutaway and the finishing is made with a thin layer of matt varnish, leaving the pores of the wood open for full resonance. Available with spruce, the Prudencio Saez Stage has a rosewood body, ebony fingerboard and a truss rod inside the neck. It comes equipped with Fishman INK IV electronics. Of course, it also sounds unplugged.